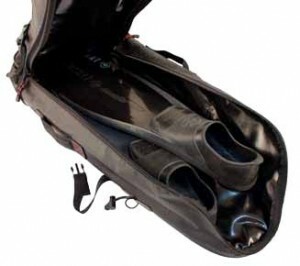 The new Beuchat Mundial Spearfishing Backpack revolutionises the way we carry our spearfishing equipment – from shore dives, to overseas trips, this compact, comfortable and most importantly affordable gear bag is one of a kind at Adreno. What we love: -	main component with a ventilation mesh and a drain hole -	secondary cool compartment (outside pocket) for carrying cold drinks or fish -	side fastenings for two spearguns -	external elastic zigzag strip for quick stowing, e.g. for a towel -	side straps for reducing the size of the pack -	double shoulder strap adjustment. This backpack comfortably fit your fins, wetsuit, accessories and two spearguns as well as a special cool compartment to fit food, drinks or fish! Beuchat have really thought of everything in designing this bag and it has resulted in an unbeatable, top of the range product. Don’t sweat the long walks down cliffs, rocks and hot sandy beaches in discomfort trying to get to your favourite shore diving destination anymore – grab one of the Beuchat Mundial Spearfishing Backpacks for just $99.00 and you will be set to travel in comfort.